Sorry I just had to add that part, because that’s what normally follows the “Let’s Go!” in our house. Then a scramble ensues for all the buddies and very important items that just must go with us. This trip involved Goofy and Elmo, but we’ve been know to take along balls, magnets and most recently flashlights. Anyway, this is my Studio Calico Trendspotting Ombre homework. I followed an example by Becky Novack in which she used varying shades of paper and squares to create her ombre background. I chose several of the text printed papers from the DCWV A Type of Art Stack to make mine. Can I just tell you how much I love this stack? I LOVE paper with printed words on it, and this stack is full of all types. Yippee!! I will be coming back to play more with this ombre trend soon. 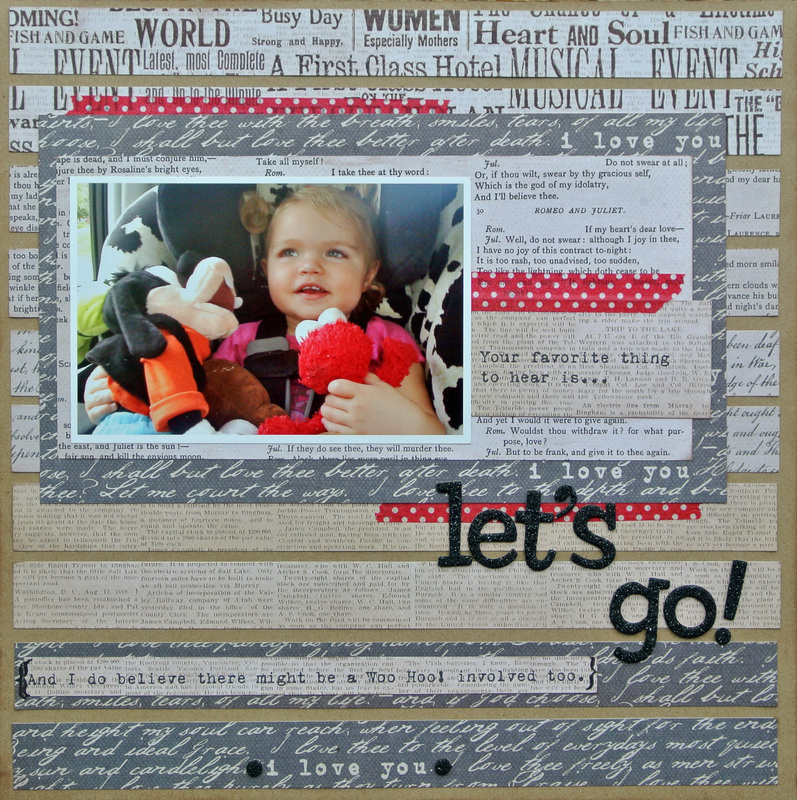 Lisa Truesdell had the idea to use Mister Huey’s Color Mists on patterned text paper that is calling my name. Hmmm…wonder if I have any to spare? He he! Too cute! We had Elmo watching cartoons with us this morning.